Summary:Following her pitch-perfect debut Open Road Summer, Emery Lord pens another gorgeous story of best friends, new love, & second chances. 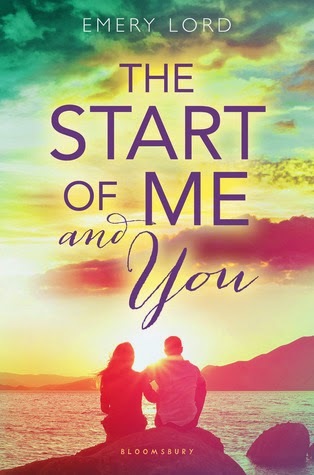 My Thoughts: The Start Of Me And You was a very sweet novel! We are introduced to Paige who lost her boyfriend about a year ago. She had only been dating him a short while but long enough for everybody to know her as his girlfriend. She’s gotten a lot of pity looks along the way. And she’s learning to overcome her fears surrounding his death. She makes a plan to reinvent herself. She wants to get the hottest boy in school to notice her, Ryan Chase. She’s had a crush on him for a while. But then there is his cousin Max who she becomes friends with. I liked both boys, I really did but I always felt more for Max. He was a great friend and I felt like he and Paige had more in common than Ryan and Paige. Max always made me smile and laugh and even though Ryan was sweet too, Max was just for me. I also loved the drama with her parents. Talk about awkward but it made things seem realistic. I could see that happening. I loved the scene with the spin the bottle game. I just liked all the little moments. I want to say so much about this one but its just a sweet romantic one I want you to read for yourself! Overall: Loved all the characters! Loved Paige’s friends. Loved Max and Ryan. Loved her parents. Loved Paige’s little sister. I just adored this one! I thought it was such a cute contemporary story! I highly recommend this one! Cover: Cute! Love the colors. They are so pastel and cute!